Do you ever find yourself at the grocery store buying a week’s worth of food, then reach for a rotisserie chicken because you no long have the energy to go home and cook what you just purchased? I admit it, I am guilty. But have you ever looked at the ingredients label on that chicken? Yikes! 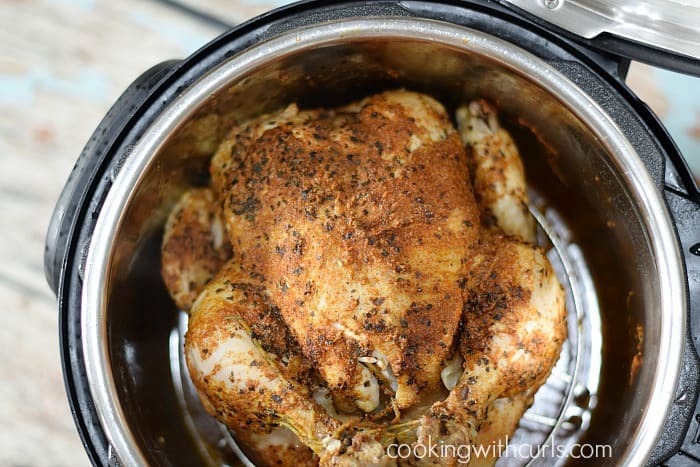 My Instant Pot Faux-tisserie Chicken is pure goodness….. It is not injected with brown sugar or any crazy sounding ingredients. There is no caramel coloring to be found, just chicken, olive oil, fresh onions, garlic, and seasonings. That’s it!! You can use any pressure cooker to prepare this recipe, but you may have different times and buttons. 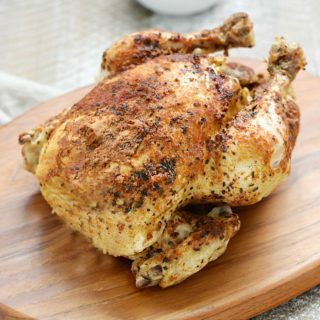 If you do not have a pressure cooker, follow the directions in my Classic Roast Chicken post to bake in the oven. Rub chicken with one Tablespoon of olive oil and sprinkle with salt and pepper. Place the onion wedges and garlic cloves inside the chicken…..
Use butcher’s twine to secure the legs….. 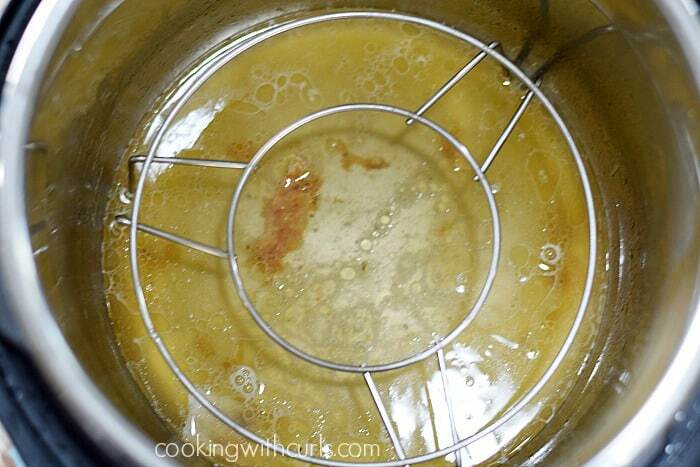 Turn on the pressure cooker and press the Sauté button…..
Add the remaining olive oil to the metal pan. When hot, add the chicken and sear/brown both sides, about 4 minutes per side….. Guess who forgot to oil the chicken first? Guess who’s skin stuck to the bottom? Remove the chicken and set aside. 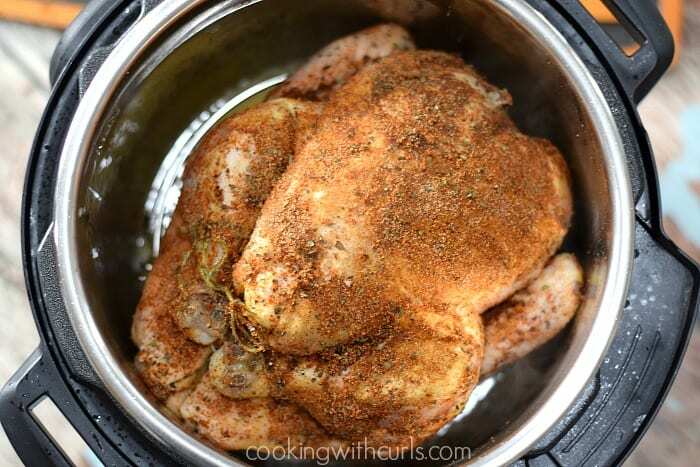 Place the trivet at the bottom of the metal pan and add the chicken stock or water…..
Sprinkle seasoning mix over the entire chicken, rubbing it in and spreading it around to cover the entire chicken. 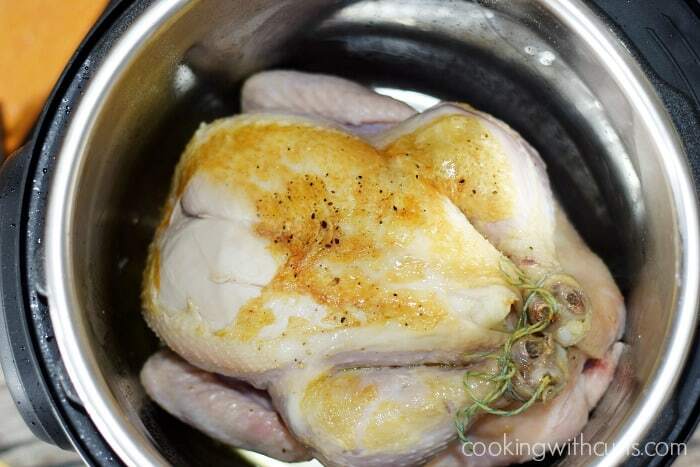 Place the chicken, breast side up on top of the trivet and secure the lid…..
Make sure the lid is in the “Sealing” position, not “Venting”…..
Set the pressure cooker to Manual and set timer for 25 minutes by pushing the + button….. When the timer beeps, allow the pressure to release naturally for 15 minutes. If the lid will not open, quick release the remaining pressure and remove the chicken….. 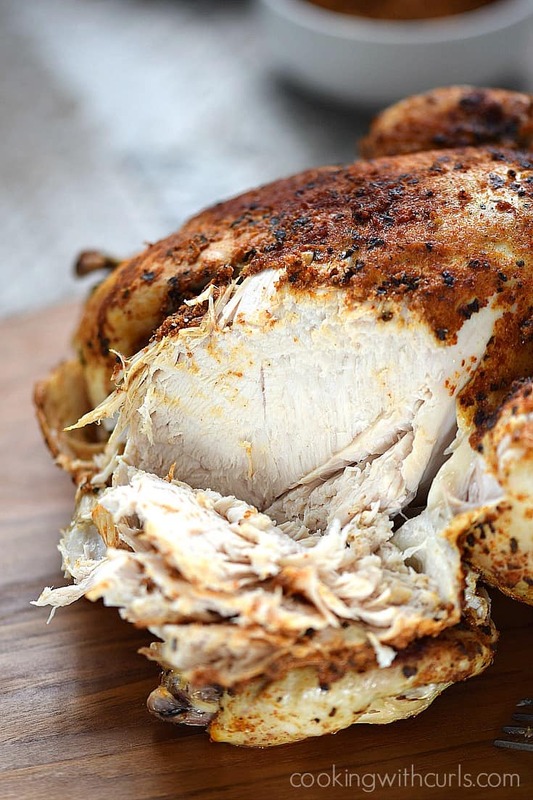 Allow chicken to rest for 5 to 10 minutes before serving….. If your pressure cooker did not come with a trivet you can purchase this one, it’s the one that I used to make this chicken, or this version with handles. 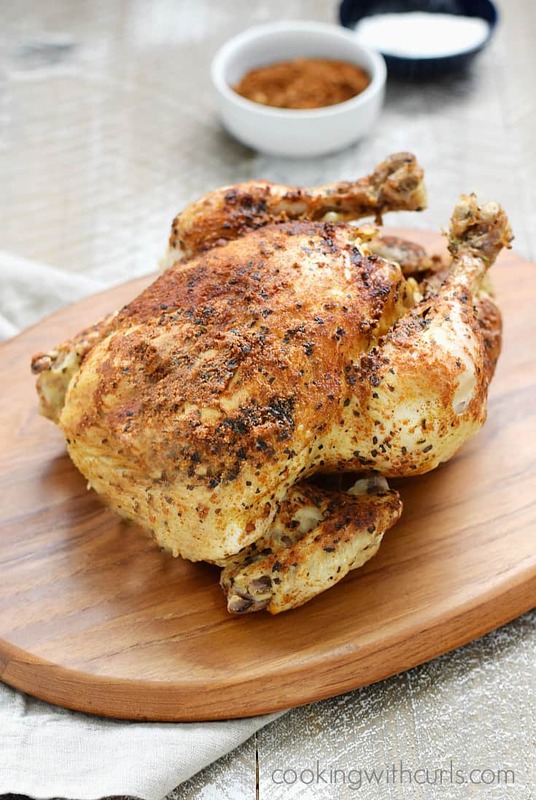 Greek Roasted Chicken – these next two are not Instant Pot recipes, but they can still be cooked using the same instructions. Peruvian Roasted Chicken. The Peruvian Chicken will need to marinate, so plan ahead. Place the onion wedges and garlic cloves inside the chicken. 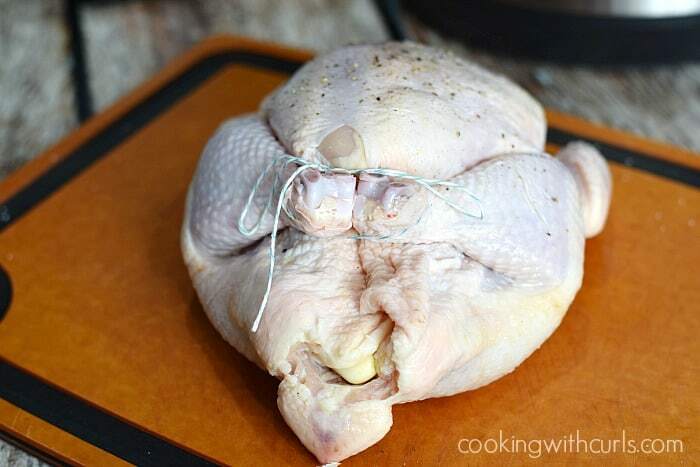 Use butcher's twine to secure the legs. Place the chicken, breast side up on top of the trivet and secure the lid. 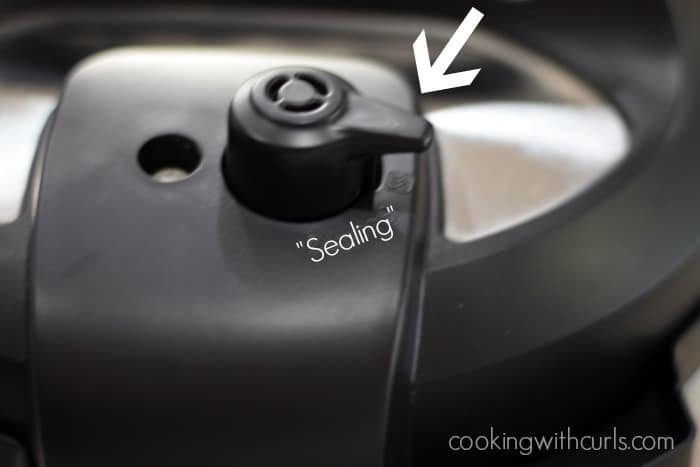 Make sure the lid is in the "Sealing" position. Help me. The smallest chicken I could fiind was a 5 pound chicken. How would this change cooking time?? You would need to use an 8 quart to fit a 6 pound chicken, nothing over 5 pounds will fit in a 6 quart. My chicken was just under 3 pounds, Marie. Others on this reply have said they have cooked bigger than 3 lbs I their pots and I thought they were also 6 qts. Even a 3 lb chicken looks too big to fit to me. This was great but I do have a question as I am new to using the instant pot… Any tips for how you flipped the bird when doing the searing? Once it was down in there seating and the pot was hot with hot oil… it was VERY difficult to flip over an oiled chicken without burning myself. Luckily my husband walked in right as I was attempting and helped. How do you do it? New to the IP world, this recipe sounds awesome, want to try it soon; That said, I have an IP Mini, any variations on time? Assuming I can find a small bird. This looks great but I’ve read a lot of comments about dry and over-cooked chicken when done this way. Contrary to your recipe notes, we made a similar recipe without the trivit and reduced the broth to 2/3 cup. The bird was juicy and perfect, with no sogginess. Also, after making a few different whole chicken recipes in he IP, we’ve found that a pressure cooking time of 8 min/lb followed by a NR of 15-20 mintes gives a consistently juicy and tender chicken. Thanks for your wonderful post and great photos, all very nicely done! Hey there! Loved this. One point of clarification: it’s listed at 91 calories per serving (love that there are nutrition facts–thanks!). How many ounces do you mean a serving of this to be? One? Four? Thank you! Hello Lisa! This is a wonderful recipe! I had a little question: I tend to go for white wine when dealing with a whole chicken – would it be okay, in your opinion, to opt for wine over the broth in the bottom of the IP? Or half wine, half broth? Wine just tends to deliver SUCH lovely flavor with poultry. Curious how you came to 91 calories per serving but only 1 gram of protein. Nutrition facts seem off (1 gram of protein?) especially since the recipe includes a chicken. I’m still trying it though ? Western rub. I also made a gravy and it too was very tasty. I’ve now subscribed to your site. Thank you so much Allyson, I am so glad you enjoyed it!! 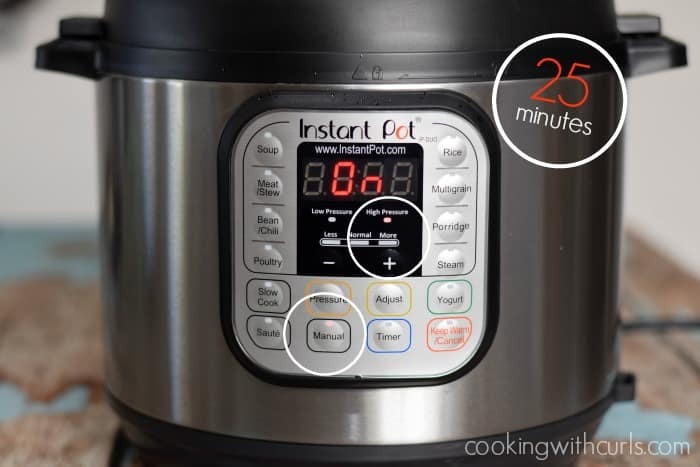 How do you keep the skin from getting stuck on the bottom of the Instant Pot when searing both sides for 4 minutes? I used a full tablespoon of olive oil. Thanks for your help! More oil would probably help, Matt. 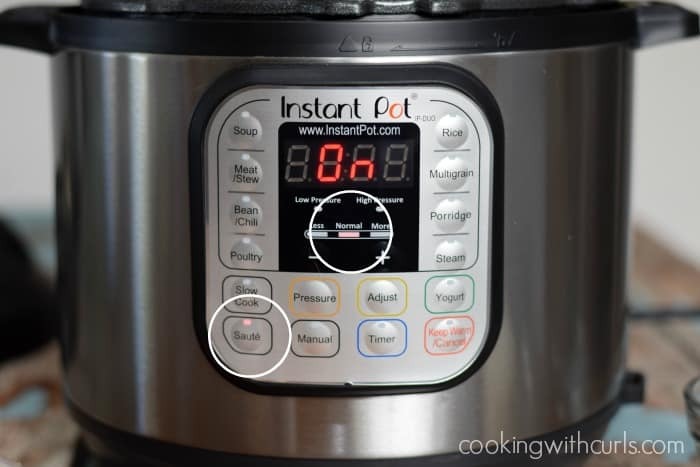 If you have a newer instant pot or an 8 quart, I would try to pressure the Saute button a couple of times to drop it down to a lower setting so it doesn’t get as hot. I have not tried this myself, bu I have heard that it is possible. I hope that helps! When you mention 25 minutes, should it be on high or low pressure cooker? The recipe doesn’t specify this. Hi Madina, it is High Pressure. Have made this a couple times wth great success. Just wondering what you use the liquid for afterwards besides gravy or chicken broth? Is it okay if the chicken is not completely thawed before cooking?